Some Saccharina latissima blades are showing a variety of symptoms: some large area with some discoloration, necrosis and dark spot but also some holes. 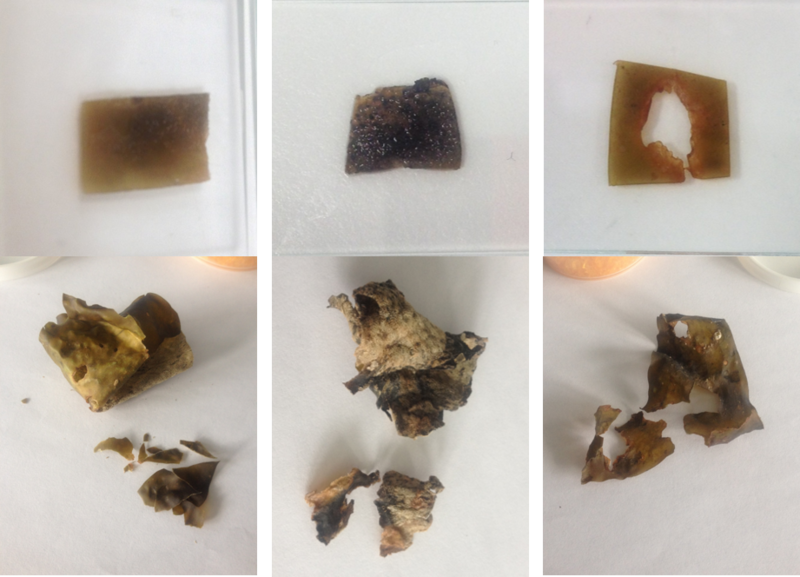 Those samples are from 2.5 years old S. latissima cultivated in Hjarnø Hage, Denmark (55.819346, 10.127866) and have been reported by Teis Boderskov. We made thin cross-sections (30um) of the 3 pieces of Saccharina latissima conserved in RNA later and then incubated them in different fluorescent stains for rapid detection of yeasts, fungi and parasitic organisms under microscope. We use a part of the 3 samples dry material for molecular analysis i.e. DNA extraction follow by DNA amplification (18S ribosomal RNA) hoping for the pathogen identification. 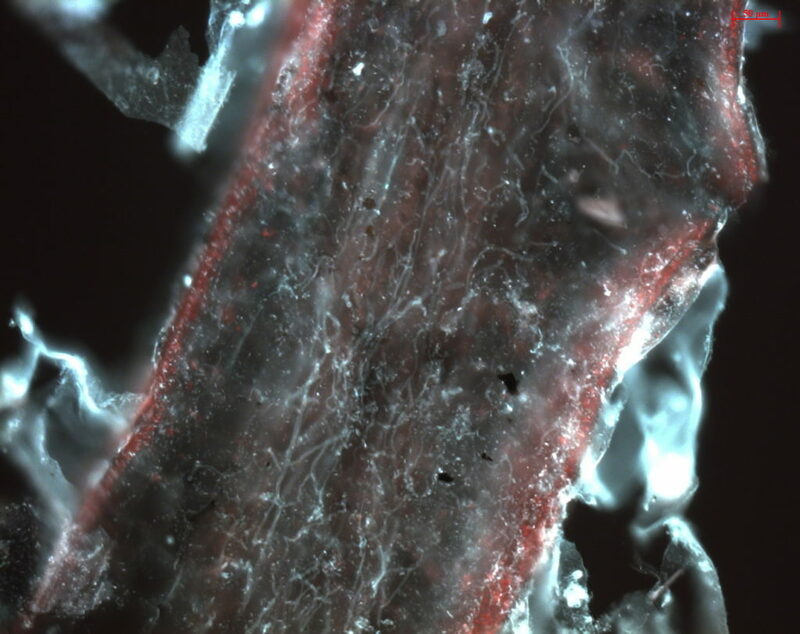 One of the fluorescent staining (WGA-FITC) shows that the three samples are heavily infected by a fungus, how could be the pathogens responsible for the symptoms. 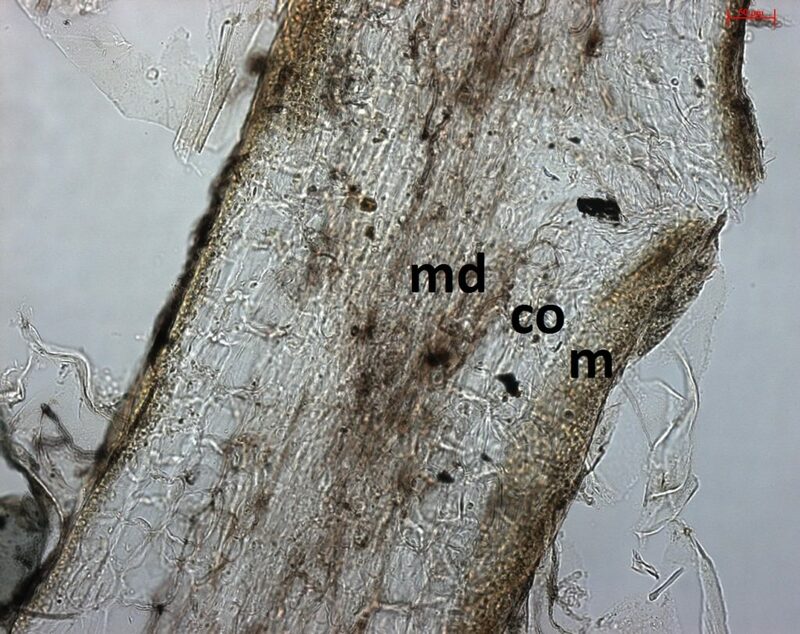 The fungus is present everywhere in the blade but more concentrated in the medulla (md) than in the meristoderm (m) and in the cortex (co). On the 3 samples, the 2nd one shows the better DNA amplification that we used to hopefully identified the Fungi pathogens species. Sadly, the sequencing chromatogram shows some background noise probably due to the fact that we are working with environmental sample. Nevertheless, with the data that we obtain, we are able to show that the potential pathogens could belong to the Lulworthiales genus. The Saccharina latissima sporophytes showing some discoloration, dark spots, necrosis and holes seems to be highly colonised by a fungus. This potential pathogen could belong to the Lulworthiales genus, a group of marine Ascomycota, class Sordariomycetes. They are typically found growing on submerged wood or on seaweed. Saccharina latissima showing discoloration, necrosis, hole and dark spot on the full blade. On the blade, 3 pieces of tissues were harvested and each conserved in one tube of RNALater and another one dry in silica gel.